Wednesday was getaway day, so another afternoon game was on the schedule. 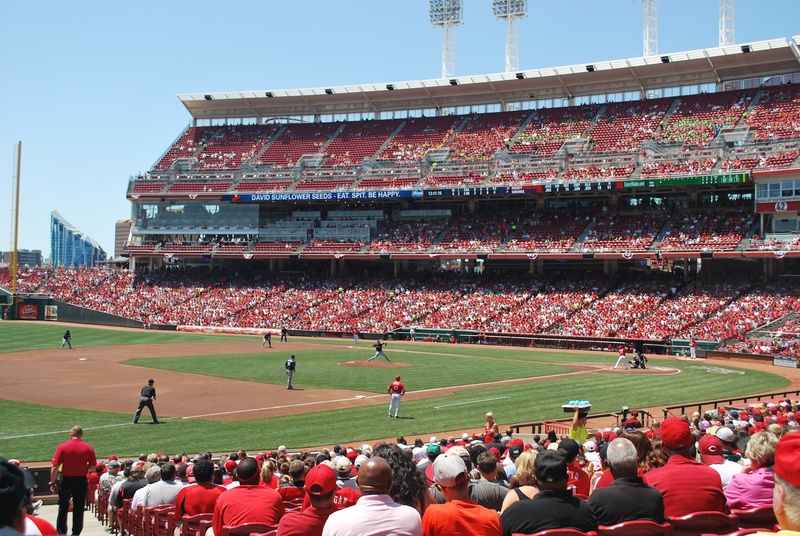 The Reds schedule their weekday afternoon games at 12:35, and it’s a good thing and a bad thing at the same time. It’s good because you can get out of the city before rush hour, and it’s bad because there is 30 less minutes between the game the night before and the day game. Victoria had asked me to pick up some Skyline Chili, so on my way to the game on Wednesday I stopped at a Kroger and picked up two cans. $3.69 for a can of chili seems ridiculous, but it is delicious. I pulled into the lot next to Paul Brown Stadium, paid the $10, and made my way towards Great American Ballpark. I got to the will call window to pick up my Brewers-provided ticket, only to realize I didn’t have my wallet. When I took it out to pay for parking I must have just set it on the passenger seat. I was still able to get my ticket (by saying my name, how many tickets were there, and who was leaving it), but I didn’t want to leave my wallet [visible] in my car for four hours. It was 11:50 at this point, and I was supposed to meet Niko at 12:00 inside the ballpark. I decided I would walk back and get it (it’s about 8/10 of a mile roundtrip). I walked as fast as I could and it probably wasn’t the best for my knee, but I made it back and was inside by 12:02. As you can see, the person who filled it out just put “Lucky Fan” in the name field. I know what I’m doing is pretty cool, and some people might be envious, but I don’t consider myself “lucky” in the sense. I worked really hard to put myself in position to make this dream come true, and luck doesn’t have much to do with it. I feel lucky to be alive, because at times I wasn’t sure if I was going to make it. I also feel blessed and grateful that the Brewers are backing me in this endeavor, but not lucky, because I don’t think luck was involved. They took me down into the bowels of the stadium and we stopped outside the hallway that leads to the field. There was a cameraman there from WCPO Channel 9 Cincinnati and he wanted to do a short interview. I got mic’d up and the four of us walked down the hallway and into the camera well. We did the interview with my back to the Brewers dugout, and I’m not sure how it’s going to turn out. I think I did a good job answering the questions, but I was really hot from the speed walking I had just done and the fact that it was almost 90 degrees. A few times I had to wipe my face to prevent sweat from dripping into my eye. After the interview I stood on the warning track and had Julia take my game number photo for me. I like that you can see a kid throwing out a ceremonial first pitch as the picture is being taken. 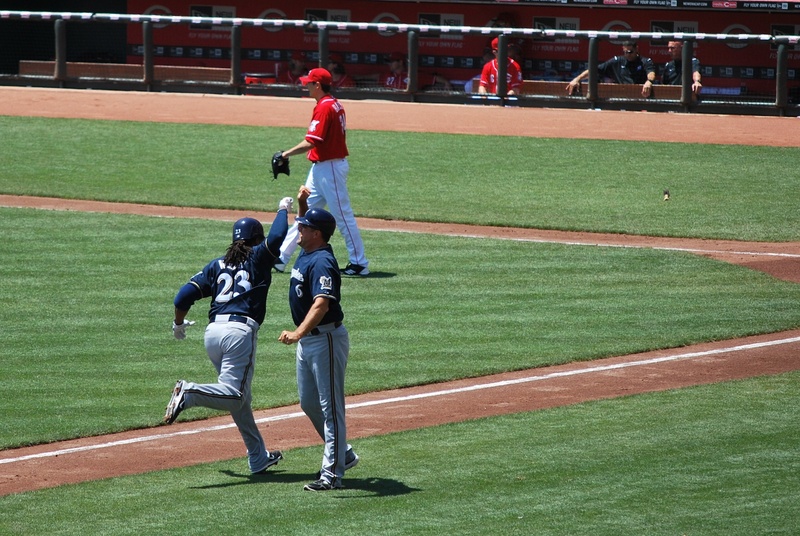 We then walked around towards home plate and Tim Dillard said “Don’t bounce it” as I walked past the Brewers dugout. 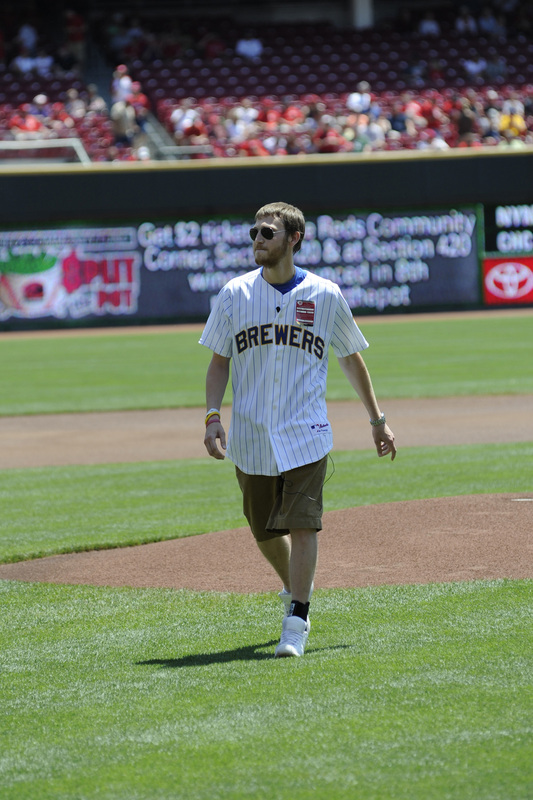 I didn’t have time to stop and explain that I wasn’t throwing out the first pitch, but I laughed and waved. When we got to the backstop I was handed the game ball and rosin bag. 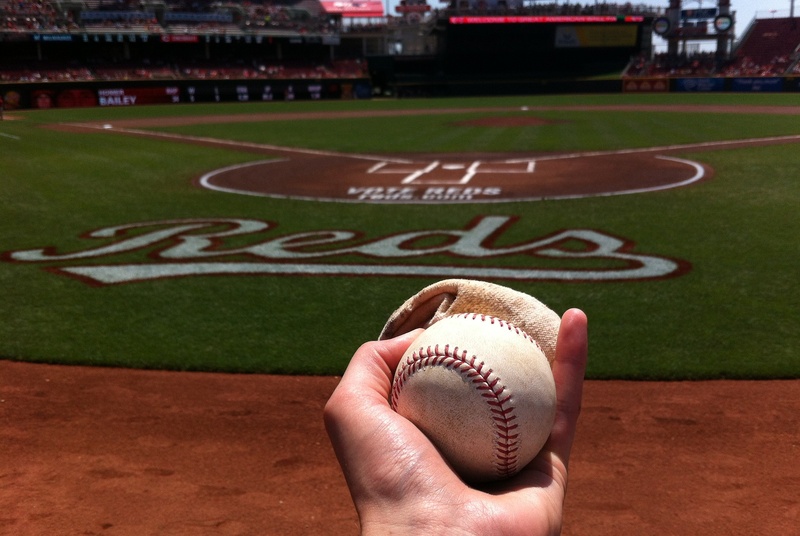 I just realized that the ball may not have even been used for the first pitch, because if the pitcher threw one in the dirt while warming up the ump switches it with a clean one, and the original one is discarded. We stood up against the backstop as the national anthem was sung, and then it was go time. Kathryn Braun (no relation to Ryan) was directing people on the field, and told me where to stand and what to do. There was a cameraman right in front of me as I faced the stands on the first base side. When he started rolling (and I was on the jumbotron) I was instructed to start waving. 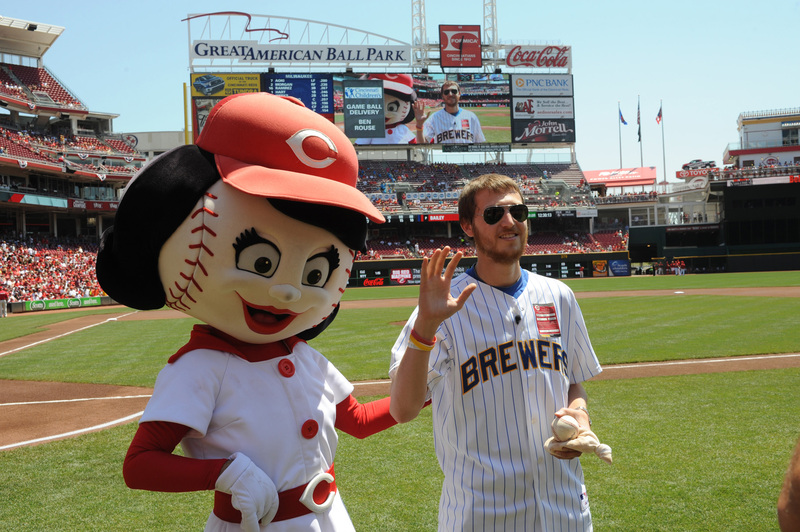 That’s Rosie Red (sometimes referred to as Mrs. Redlegs) next to me. It is uncertain if Rosie Red and Mr. Redlegs are a couple, I’m sure TMZ has a story if you’re interested. I always think it’s weird when the person is just waving for an extended period of time. I even looked at Kathryn at one point and asked if I could stop waving. As I was standing there the public address announcer was informing the fans of what I was doing and why. They plugged Be The Match and at one point I think he said “you could possibly save someone’s life, like Ben’s”. 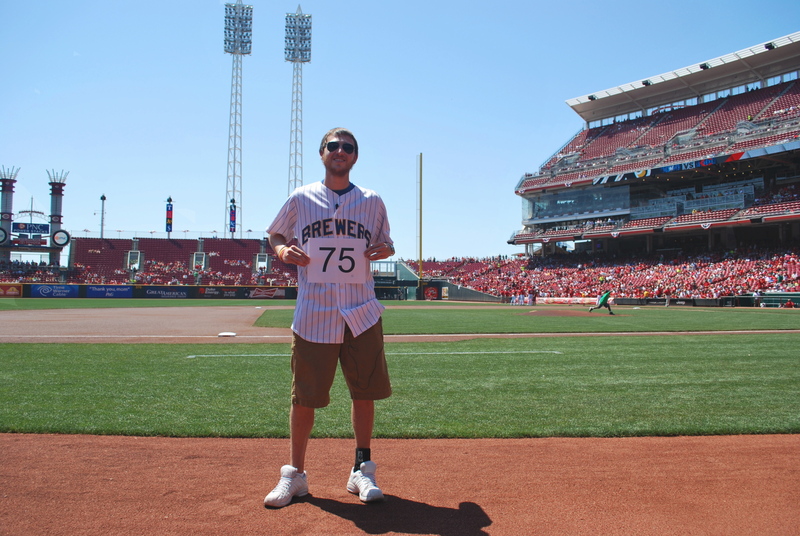 That may have turned people off because what Reds fan would want to save a Brewers fan’s life? I’m kidding of course. I was then instructed to deliver the ball and rosin bag. 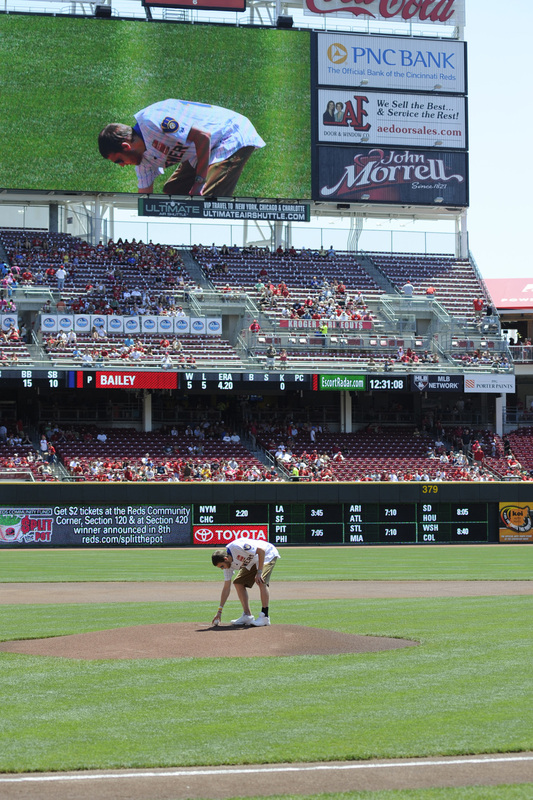 As I was placing the ball on the mound one of their photographers got a picture. I included the picture of me walking back from the mound below. I glanced towards the Brewers dugout to see if Dillard was on the top step, but I couldn’t see him. I was going to give a Shooter McGavin point if I saw him. I’m wearing the ankle brace to try and get my foot to pronate better. As you can see my left foot is supinating, and I roll off onto the lateral (outside) side of the foot. My big toe doesn’t touch the ground and we think the supination may be leading to the knee problems. 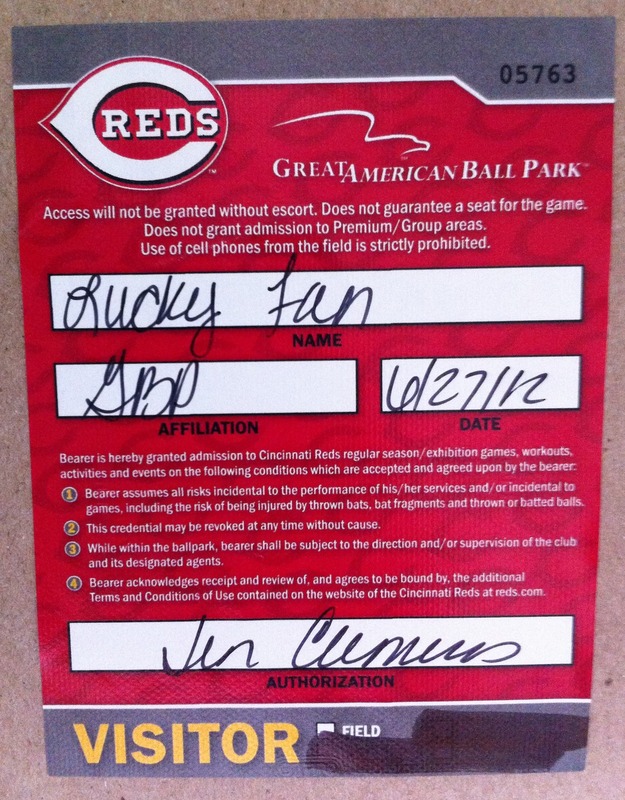 I have to give a shout out to Jarrod, who works for the Reds and forwarded these pictures to me yesterday afternoon. Now, I had asked if maybe I could just go up into the seating bowl right from the field, because I was afraid I would miss the first few pitches if I went up through the tunnels. They had said they might be able to do that, but we wound up just going back the way we came. I was walking pretty fast, as I had a pitch streak going that I was trying to extend. I took two steps at a time when we went up a staircase, something that I haven’t done for months now because stairs are what causes the most pain. I thought it was worth it, and I made it to the field level concourse and then to the top of a section where I could see the field. I saw that Homer Bailey’s pitch count was at one, and I had missed the first pitch by about 10 seconds. Norichika Aoki had popped out to the shortstop on the first pitch of the game. It was a little frustrating, but if one person joins the registry or makes a donation because of the exposure I got while delivering the ball and rosin bag, it’s worth it. I went to my seat in section 112 after the top of the first, and this was the view. In the top of the second Corey Hart tripled to lead off the inning and Ricke Weeks followed with a home run to straight-away center, just narrowly missing Chris Heisey’s glove as he reached over the wall. Here’s Rickie giving Ed Sedar a forearm shiver as he makes his way towards home plate. In the third inning the Brewers increased their lead to 3-0 when Aramis Ramirez drove in Aoki with a single to left. The Reds got that run back in the bottom half when Phillips’ single scored Heisey. Ransom hit a two run home run in the top of the fourth inning to increase the lead to 5-1. As he touched home Chart was there to thank him for driving him in. The Reds got a solo home run in their half of the fourth, and another run in the bottom of the eighth on an RBI groundout from Cairo. In the top of the ninth the Brewers scored three more runs, one coming on an Ishikawa RBI single, the other two by bases loaded walks from Ramirez and Chart. The Reds got a leadoff home run in the bottom of the ninth, and the second batter was retired on a flyout to Nyjer Morgan. 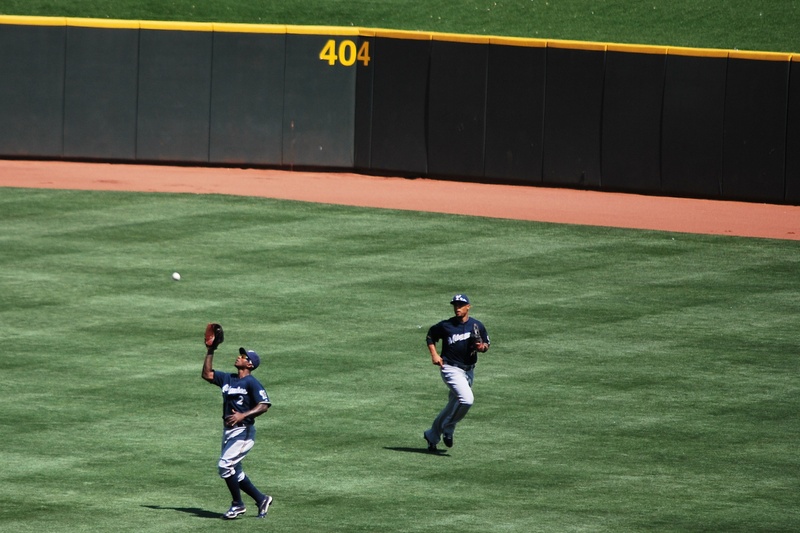 Here he is preparing to make the catch as Carlos Gomez backs him up. The solo home run is all the Reds could muster in the ninth inning. 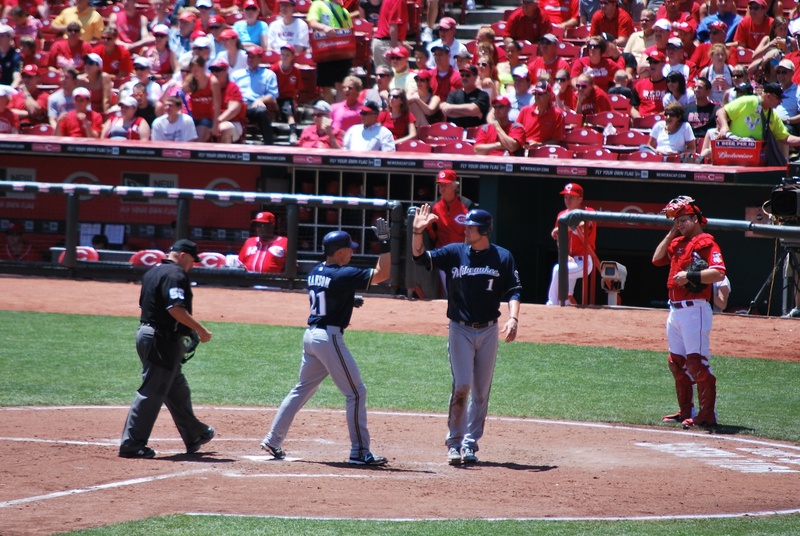 Final Score: Brewers 8 – Reds 4. 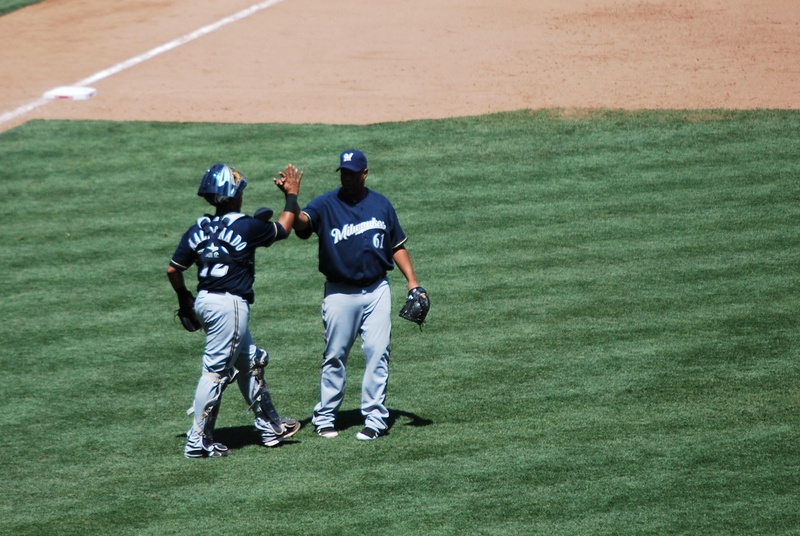 Livan Hernandez, who the Brewers recently acquired, pitched the ninth inning and got a high five from Maldonado after retiring the last batter of the game. I almost forgot to mention Zack Greinke, who pitched six solid innings, giving up two runs on five hits, while walking one and striking out three. He’s our stopper and helped prevent the Brewers from surpassing their longest losing streak of the season. 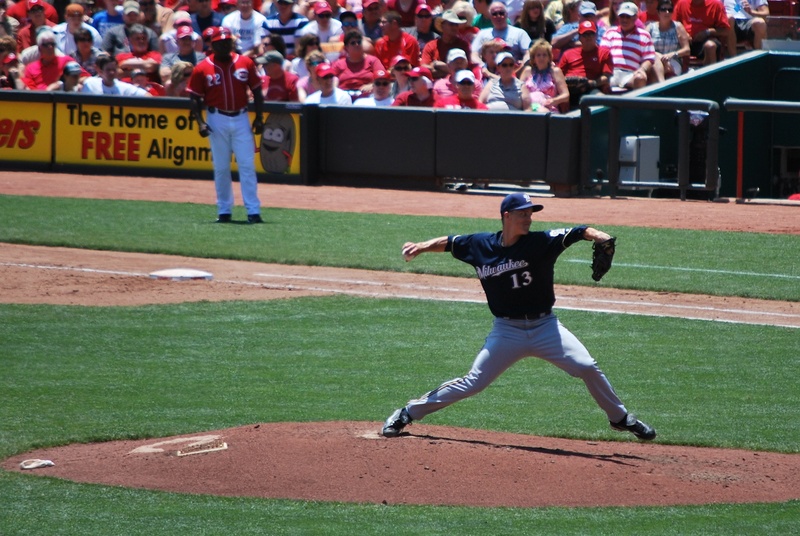 Here he is in the fourth inning, and the pitch resulted in a strikeout of Homer Bailey to end the inning. Right after the game I jumped in my car and drove back to Madison. I made it in 7 hours and 9 minutes, averaging 64.9 miles per hour, which includes the one 10 minute stop that I made. The fastest I ever hit was 80, and that was just briefly, so it was a leisurely drive through parts of four states. It’s an off day today, and then I’m right back at it tomorrow for the first game of a three game set with the Diamondbacks. Ten games in ten days and then it’s the All-Star break! I’m looking forward to the break, and being able to watch a baseball game on TV in it’s entirety.